A group of black Christian conservative leaders are calling on House Speaker Paul Ryan, R-Wis., to censure Democrat Rep. Maxine Waters of California for comments she made last month urging supporters to directly harass administration officials at "anytime" and "anywhere" they see them. African-American conservative activists and religious leaders gathered on Capitol Hill Thursday to pressure Ryan to formally condemn Waters on the House floor and proclaimed that Waters doesn't speak to the "faith of all black America." In question are Waters' comments at a California rally in late June in which she called for critics of the administration to confront Donald Trump administration officials when they see them at a restaurant, a gas station, a department store or wherever else they might be found in public. Waters' remarks came as there was much media coverage over Trump administration officials — White House Press Secretary Sarah Huckabee Sanders and Department of Homeland Security Secretary Kirstjen Nielsen — being kicked out of restaurants because they work for the Trump administration. "Her call to extremism based on where another American citizen works and who they associate with must be sternly addressed by Speaker Paul Ryan," Star Parker, president of the Center for Urban Renewal and Education, said at a press conference. "An apology is not enough, nor did she offer one when asked by House Speaker. As we move into two months of intense debate over SCOTUS nomination, the censuring of Maxine Waters becomes of extreme urgency." Bishop Aubrey Shines of the nondenominational Glory to Glory Ministries in Tampa, Florida, asserted that lawmakers like Waters who say these types of things are also putting law-abiding supporters of the president — such as themselves — in harm's way. "[Waters is] asking those who follow her and those that are part of her party to make sure that individuals like myself are accosted — not just the cabinet — wherever we are," he said. "She said, and I quote, 'anywhere, anytime.' That means in supermarkets or in restaurants. Wherever those of us who have supported this current president find ourselves, she is asking those that follow her to make sure that we are harassed in some sort of form." Diante Johnson, president and founder of the Black Conservative Federation, said that he has heard of instances in which black interns on Capitol Hill have been denied Uber rides because they were wearing pro-Trump "Make America Great Again" hats. "This is the effect of Maxine Waters," argued Johnson. "This is the effect of the Congressional Black Caucus members who haven't called her out. This is the effect of Paul Ryan who hasn't processed the censure. 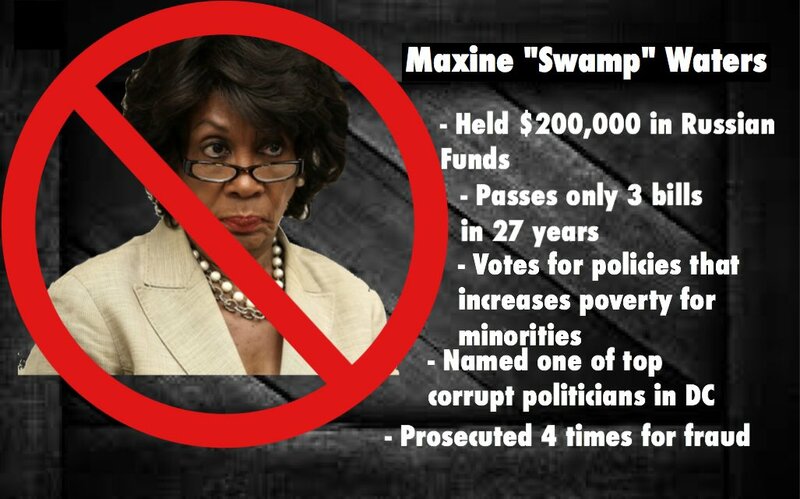 This is the effect of the Democratic Party as a whole who hasn't said, 'Maxine Waters, you can't say that you shouldn't say that.'" While the Democratic Party as a whole has not spoken out about Waters' remark, House Minority Leader Nancy Pelosi did call the remark "unacceptable." According to Shines, Waters' comment is the type of thing that blacks and whites across the country fought together to ensure that "we would never ever see again." "Yet, she is spewing this type of venom over and over again," said Shines, referring to the fact that Waters doubled down on her remark. "Unfortunately, her tentacles have reached as far as the mainstream media. We are now also being called trained dogs by the mainstream media simply because we do not adhere to groupthink." Shines concluded that this "type of racial divisiveness is something that is helping destroy America as we know it." Bishop David Ritchie of Operation MOBILE International Churches, Inc. proclaimed that the level of politicial incivility on display in the United States today is "crazy." "I travel around the world and I oversee churches in Nigeria and Cuba and other nations and the difference in our nation and other nations is the civility that we have," he explained. "When we have missionaries that come to our nation, one of the things that I have heard them say is that everything works here." "They are surprised that everything works — the traffic and everything. Our legislators are supposed to work and our checks and balances are supposed to work," he continued. "We go to the voting booth and we vote for people. The one that is the elected is the one that we say we want to lead and that is it. Then the next time, someone else comes in." But today, Ritchie warned, the incivility is turning the U.S. into just another nation. "Now, we are turning into other nations and say, 'Let's start fighting and let's start arguing. Let's take it to the streets. Let's no longer make things work. Let's begin to fight. Let's tear each other apart,'" Ritchie contended. "The problem with Maxine Waters is not Maxine Waters, because she learned that behavior. I don't really have a problem with her. I have a problem with people saying they don't have a problem with her [behavior]. That is the problem. She learned that behavior because people did it to her and now she is doing it to others. But why isn't anyone jumping up and down and say, 'We have order in the United States and you can't do that to people.'" According to Johnson, what the U.S. is experiencing is a "reversal in time." "We are discriminating not based upon race anymore but based upon political preference," stated Johnson. "To Maxine Waters, it is very shameful for someone who has experienced segregation to turn around and reverse it to a political party."